I enjoy cooking, learning new techniques, combining different flavors and hopefully pleasing the lovelies sitting at my table. There is a local shop here that I adore going to that has a great array of all things kitchen, plus cooking classes. Monthly, they send out a newsletter and it often inspires me. This last newsletter talked about a book called "The Grilling Book". The pictures alone had me hooked. Once I saw the recipe for Chicken under a Brick, I was off to the hardware store to get a brick! I bought a square paver brick. Boy did they think I was nuts for buying one 60 cent brick! 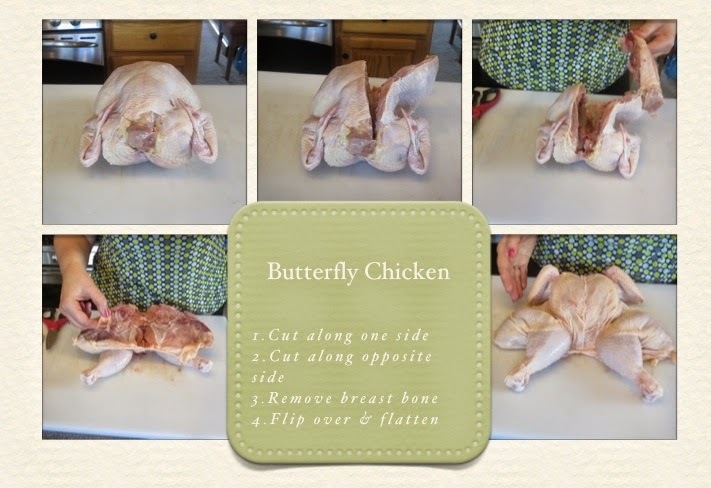 The hardest part about this recipe is you have to butterfly a whole chicken. This involves removing the spine and breast bone. Let me tell you, that was hard for me. Not because it is terribly difficult to do. It is because I get rather squeamish about that sort of business. I found out after, if you ask your butcher, they will most likely do this for you (ey yi yi, wish I would've knew that sooner!). I will save you the details of how to do it. You can either ask the butcher or google it - there are a bunch of videos that will give you all you need. Once that is done, flatten it out on a clean surface and season. Liberally put kosher salt and pepper to your taste, and some cayenne pepper. Make sure you oil the grill grate before you start and then get it up to a medium-high heat. While it is heating up, wrap your brick in foil so it is clean. Place the chicken, skin side down on the grill and put the foil wrapped brick on top. Cook until browned and crispy, at least 15 minutes. Use tongs to set the brick aside, flip the chicken and place the brick back on top of it. This keeps the meat in contact with the grill grates. Cook for 10 minutes and repeat the flipping process until it is done. How do you know if it is done? Put a thermometer in the thickest part of the thigh to check for doneness (165 degrees). It took about 55 minutes for my 4 pound chicken to be done. I just set a timer for 10 minutes and would keep flipping it. Once I got to 50 minutes, I started checking the temp. Remember to let the meat rest while you get the rest of your dinner ready. Don't cut for a solid 10 minutes. 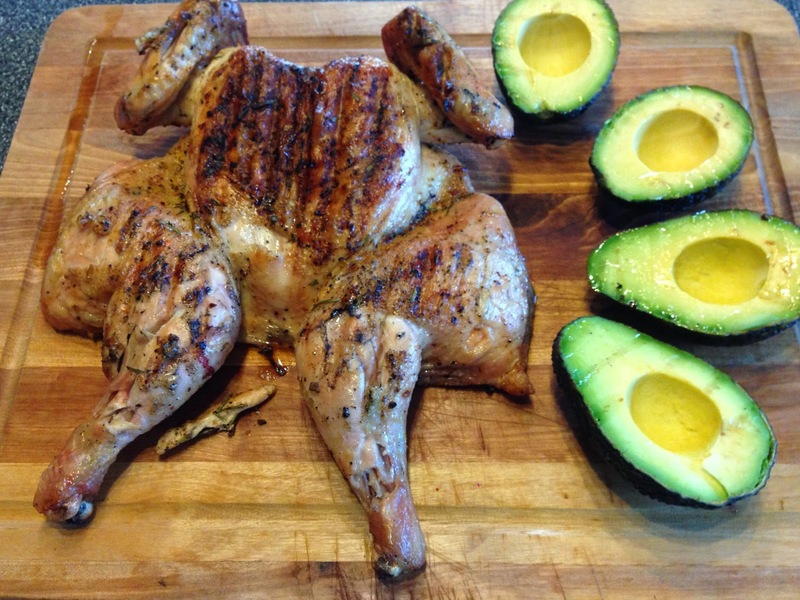 I also, grilled avocados. Slice as normal, rub a bit of coconut oil, grill for 30-45 seconds. NUMMY My only regret is they didn't get more grill marks, but that is just aesthetic. This was a fun, adventurous meal for me. Everyone really seemed to enjoy, which is the best part! !